As an instructor how do I acquire a departmental copy code? As an instructor, which printer can I send print requests to? How can I print wirelessly from my Mac? As a student, how can I print from my laptop to a campus printer? How can I get a refund for Papercut? How do I troubleshoot problems connecting with Papercut? Where on campus can I print color copies? Contact your graduate school Dean’s assistant or program coordinator to receive your departmental copy code and to verify which printer you should configure your computer to send print requests to. If you have difficulty, contact the Help Desk: (831) 647-6656 or helpdesk@miis.edu. Note: This article applies only to MIIS network PC’s. We do not connect Student laptops to Faculty and Staff printers. 1. Type \\seaotter under the Search box. 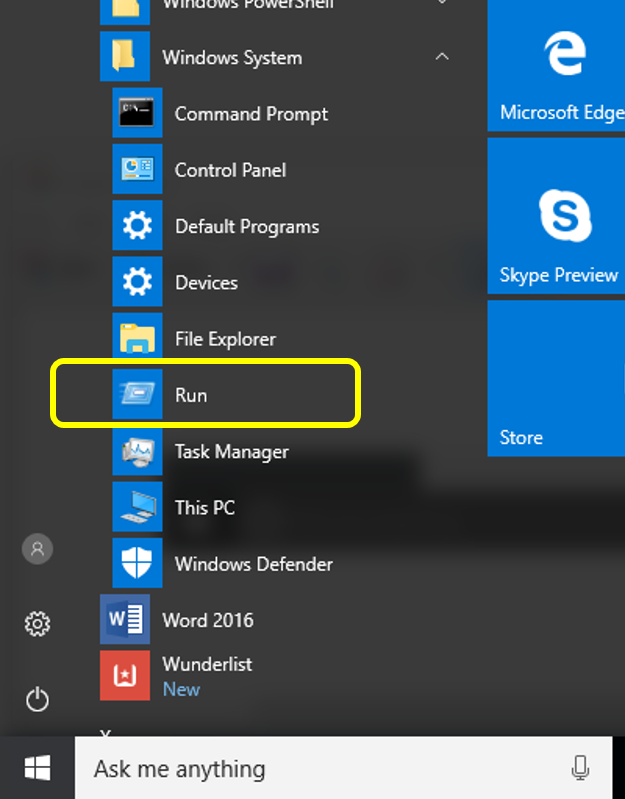 The Search box is to the right of the Windows icon. 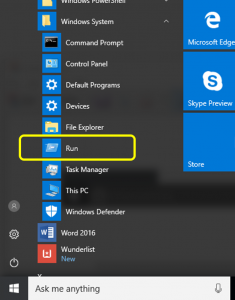 Alternatively, you can click on the Windows icon, go to Windows System>Run. The Run command will pop-up, then type \\seaotter. 3. Double click on the printer you need to install. Faculty and staff can contact the ITS Helpdesk to obtain the IP address of the copier for installation. In addition, this article applies only to Faculty and Staff PCs using the Windows 10 operating system. Students must use the Web Print feature in Papercut to print wirelessly to a Papercut Printer. 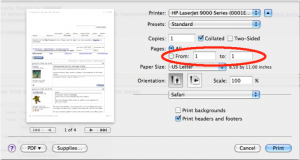 To connect to a Faculty or Staff printer, please identify the location, model number, and IP address of the copier. We currently use Canon printers with varying model numbers. This article will cover the setup of a Canon 4225. You may want to make an appointment with the ITS Helpdesk for assistance with this installation. 1. Do a Google search on the copier model number. Example, “Canon 4225 driver” This should lead you to the specific printer’s resource page. 2. 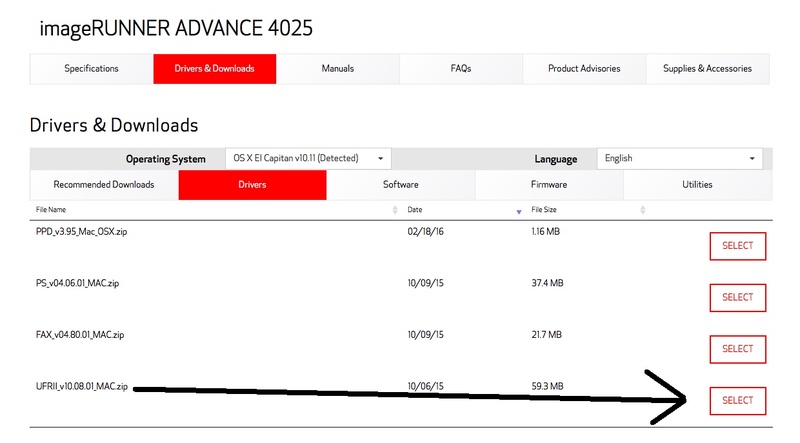 Select “Drivers and Downloads” and expand the Drivers menu. Your Windows operating system should be detected. 3. Download and install the latest UFRII driver. Extract the file once downloaded. 4. Click on the Setup file. When you see a User Account Control prompt saying, “Do you want to allows this app from an unknown publisher to make changes to your device?” click Yes. 5. Once the driver files are extracted, click Setup. When you see a prompt saying, “Do you want to allow this app to make changes to your device?” click Yes. 6. Under the license agreement, click Yes. 7. Under the Printer Setup, select Custom. Click Next. 8. 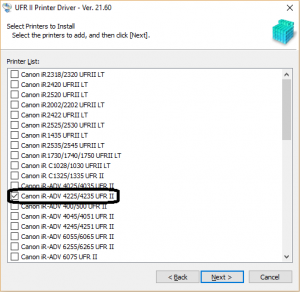 On the next window, select Add New Printers under UFR II Printer Driver. Click Next. 9. Select the printer driver to install. In this case, tick Canon 4225. Click Next. 10. On the next window, under Port, click Add Port. Select Standard TCP/IP Port. Click Ok.
11. An Add Standard TCP/IP Printer Port Wizard will appear. Click Next. 12. On the next window, fill-out the Printer Name Name or IP Address with the IP address of the printer you wish to install. Contact the ITS Helpdesk to obtain your printer’s IP address. It is also recommended to change the port name. (ie. McCone 1st Floor, or McGowan 200, etc.). Click Next. 13. Click Finish once the port is added. 14. Once back to the Printer Information window, click Next. 15. 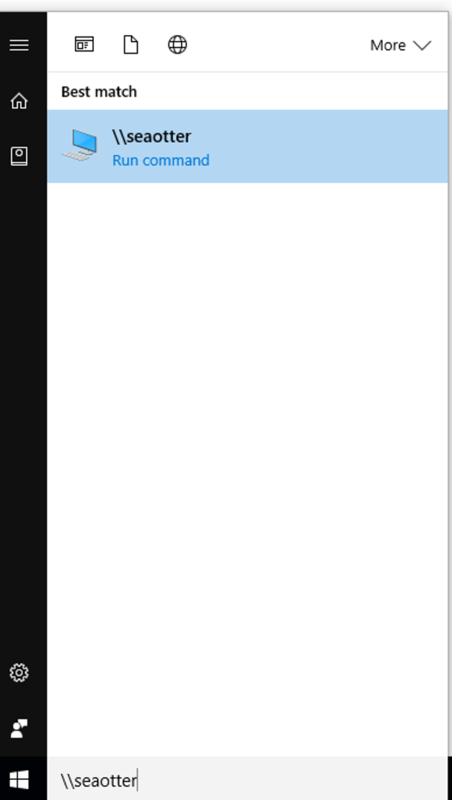 On the next window, click Start. This will start the printer installation. 16. The setup is now complete. 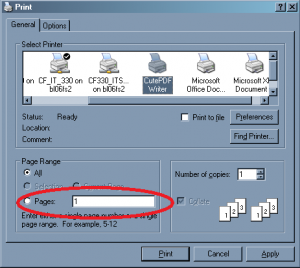 Now is also good time to print a test page to ensure that your printer installation was successful. As mentioned earlier, please visit the ITS Helpdesk for assistance with this setup. 4. Click on the Setup file. When you see a prompt saying, “Windows protected your PC,” click on More Info. 7. Once the driver files are extracted, click Setup. 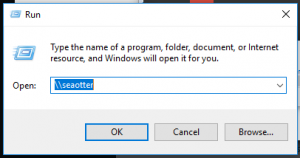 When see a prompt saying, “Do you want to allow this app to make changes to your PC?” click Yes. 8. Under the license agreement, click Yes. 9. Under the Printer Setup, select Custom. Click Next. 10. 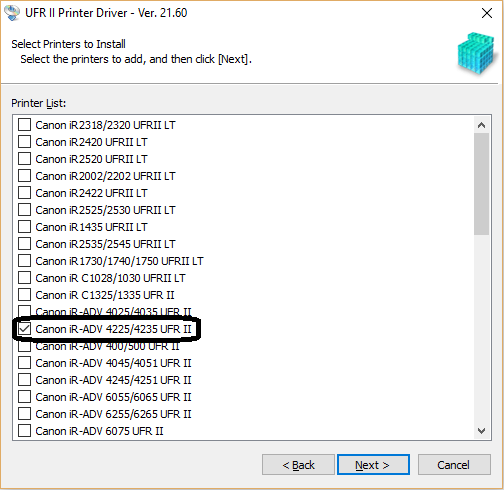 On the next window, select Add New Printers under UFR II Printer Driver. Click Next. 11. 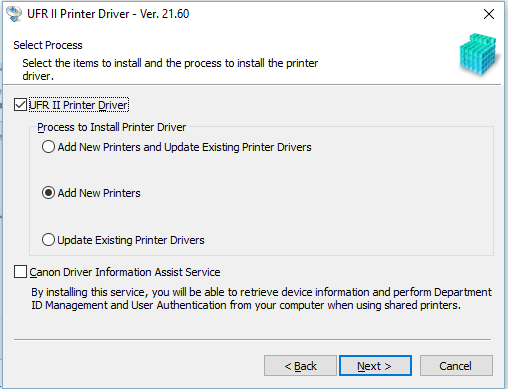 Select the printer driver to install. In this case, tick Canon 4225. Click Next. 12. On the next window, under Port, click Add Port. Select Standard TCP/IP Port. Click Ok.
13. 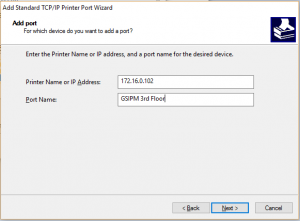 An Add Standard TCP/IP Printer Port Wizard will appear. Click Next. 13. 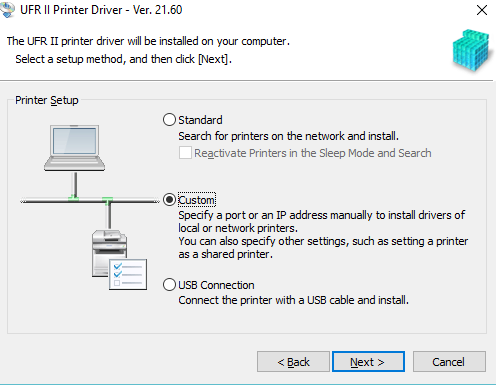 On the next window, fill-out the Printer Name Name or IP Address with the IP address of the printer you wish to install. Contact the ITS Helpdesk to obtain your printer’s IP address. It is also recommended to change the port name. (ie. McCone 1st Floor, or McGowan 200, etc.). Click Next. 14. Click Finish once the port is added. 15. Once back to the Printer Information window, click Next. 16. On the next window, click Start. This will start the printer installation. 17. The setup is now complete. Now is also good time to print a test page to ensure that your printer installation was successful. Faculty and staff can contact the ITS Helpdesk to obtain the IP address of the copier for installation. In addition, this article applies only to Faculty and Staff printers. Students must use the Web Print feature in Papercut to print wirelessly to a Papercut Printer. To connect to a Faculty or Staff printer, please identify the location and model number of the copier. We currently use Canon printers with varying model numbers. This article will cover the setup of a Canon 4025. You may want to make an appointment with the ITS Helpdesk for assistance with this installation. 1. Do a Google search on the copier model number. 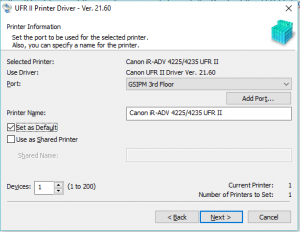 Example, “Canon 4025 driver” This should lead you to the specific printer’s resource page. 2. Select “Drivers and Downloads” and expand the Drivers menu. Your Mac operating system should be detected. 3. Download and install the latest UFRII driver. 4. 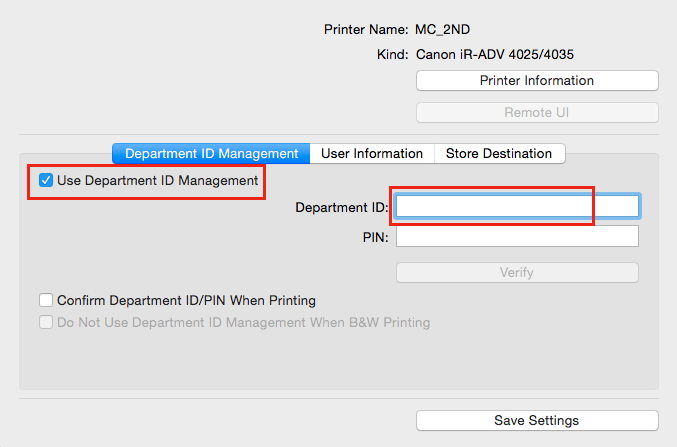 Go to System Preferences > Printers & Scanners and press the plus (+) sign to add a new printer. 5. On the next screen, choose the IP option. You will need the IP address of the printer you wish to install. Contact the ITS Helpdesk to obtain your printer’s IP address. 6. Under Protocol, select Line Printer Daemon – LPD. 8. Do not use generic drivers. 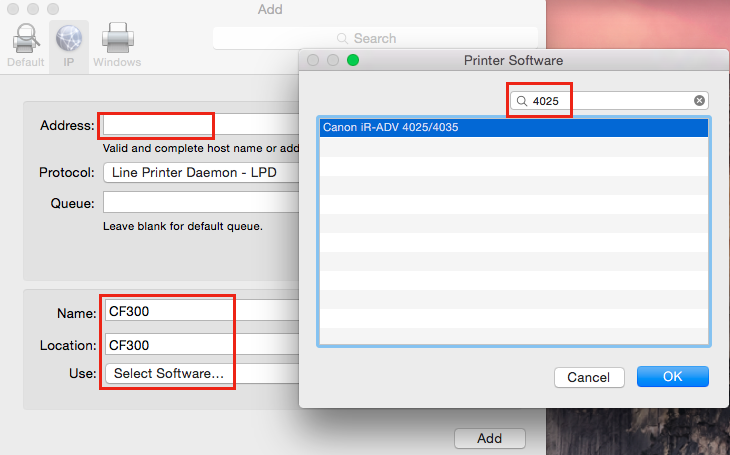 You must change the “Use” field to “Select Software” and search on your printer’s model number. 4025 is pictured in the above example. 9. Once you have made the proper configuration, click OK and Add. Next, go to the Utility tab and open the Utility. Here, we must enter the Staff or Faculty member’s copy code. 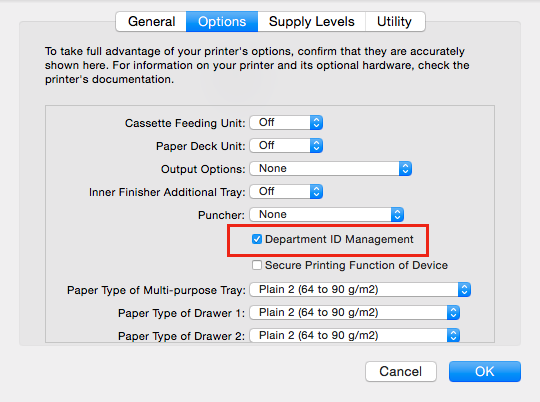 Check “Department ID Management” and enter the copy code into the Department ID field. 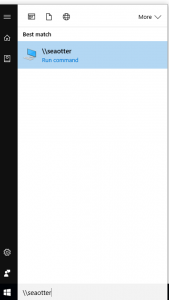 After clicking “Save Settings” close out the window using the red X (exit) button on the top left of the window pane. The setup is now complete. Now is a good time to print a test page to ensure that your printer installation was successful. Note: This article applies only to MIIS and Middlebury owned network PC’s. We do not connect Student laptops to Faculty and Staff printers. 2. Type \\seaotter in the Search Box. 4. Double click on the printer you need to install. How do I print from a laptop to a campus printer? June 7, 2010 / 3 Comments on How do I print from a laptop to a campus printer? 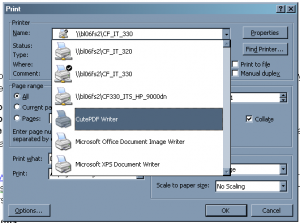 Students must use the Papercut print management system to print on the MIIS campus. This post gives you background on the process and steps to print from a laptop. A. 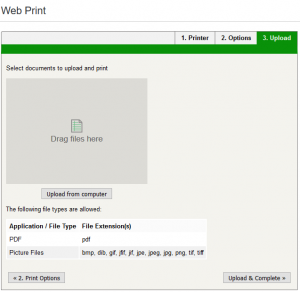 Convert – only PDF documents can be printed from laptops to campus printers. 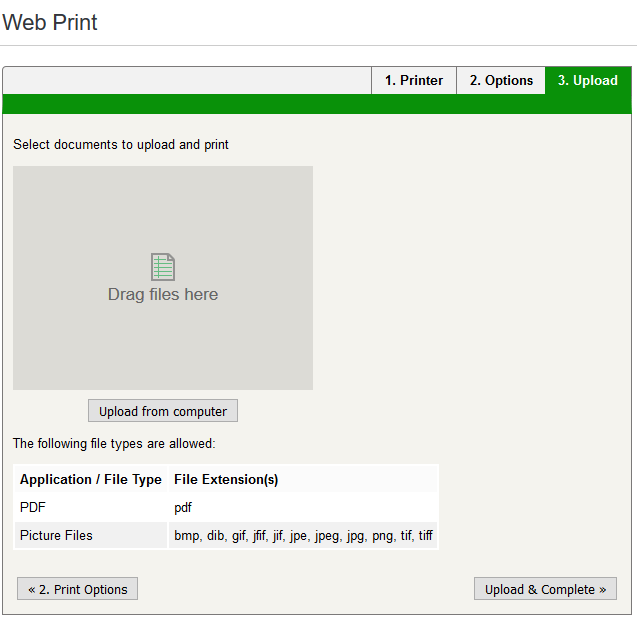 B. Upload – put your document into Papercut system – http://papercut.miis.edu. C. Release – go to any one of the four campus printers, log into its Print Release Station and send your document to the printer. Windows users can install a freeware PDF converter called CutePDF Writer, http://www.cutepdf.com. During installation, you are prompted to also install PS2PDF converter, select Yes to this option. MacOS comes with a built-in PDF converter. 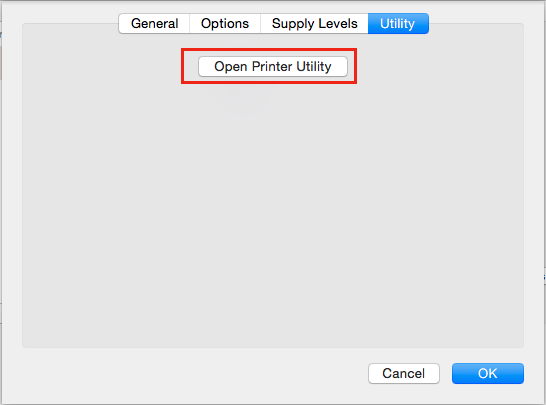 Open the document you want to print, select Print from the File menu (or Win: Ctrl+P, Mac: Cmd+P). 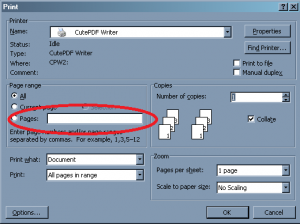 In the Printer dialog box: Windows: in the Printer name drop-down list, choose CutePDF Writer, and click OK. Mac: in lower left corner, click on the down-arrow next to PDF and select Save as PDF. Save the PDF file to your desired location. Remember the location for the upload. Open any browser and go to http://papercut.miis.edu. Log-in using your MIIS network username and password. In PaperCut, the Summary page displays. From the left-hand menu, click on Web Print. Click on the link Submit a Job. 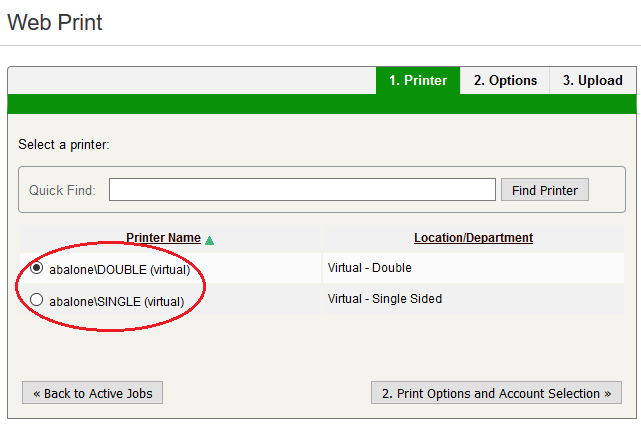 Under the Printer Name, select abalone\DOUBLE (virtual) for double-sided printing, or abalone\SINGLE (virtual) for single-sided printing. Click 2. 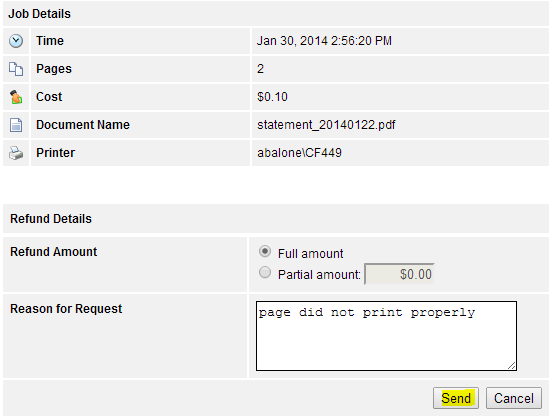 Print Options and Account Selection (figure above). Although visible, you cannot print multiple copies of a document. See the Facts section below. Click 3. Upload Document (figure above). Under Select a document, you can drag files into the designated area or click Upload from computer to select documents. Lastly, click Upload & Complete. Go to any of the four Canon campus printers and log into its Print Release Stations – Casa Fuente 449, Morse 100, Library 1st floor, and Library 2nd floor. Log into the Release Station using your MIIS network username and password. 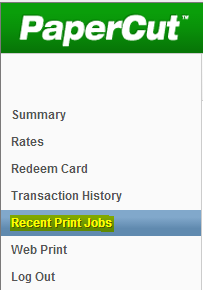 Click Print next to the print job you want to print. Your printing allowance is $50/semester, .05c/single sided or double sided. This balance rolls over each semester. You can check the status of your account at http://papercut.miis.edu; log in with your local network ID and password. You can purchase TopUp cards for addition printing within a semester at the Library or Cashiers office. You can only print one copy per uploaded document. Even though you see an option to specify more copies in Papercut, this will not have any effect. To print additional copies you must upload the document again. Documents uploaded into Papercut, and ready for printing, only remain in the system for 8 hours. After 8 hours, Papercut deletes them from the system. 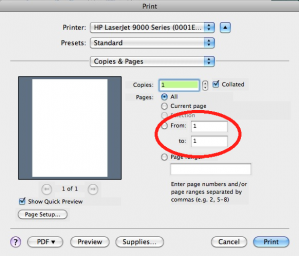 If you have a multi-page document but only want to print select pages, use the options in the Print dialog box to specify pages. Below are some examples. 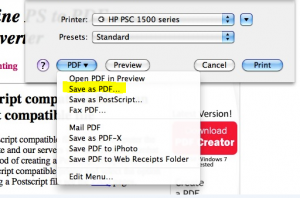 If the document is already a PDF, you can ‘convert’ it again, specifying the desired pages, then printing as PDF. March 1, 2010 / 1 Comment on Where on campus can I print color copies? Office Services offers color copying/printing for the entire campus but cannot use the individual staff/faculty or student copy codes, only department codes. All transactions must be paid for by cash or check. Office Services is not set up to accept debit/credit cards nor do they charge back the student accounts. Color is $.50 per page for single sided prints and $1.00 for double sided prints. They can print 8.5″ x 11″, 8.5″ x 14″ and 11″ x 17″. Office Services does not up charge for printing; prices are based on the lease agreement, the fee paid to Canon per print, and the cost of paper and toner for the machine. Office Services is located in Casa Fuente (439 Pierce Street) across the walkway from the Registrar and Cashier’s office. The closest alternative place for printing is Copy King on Calle Principal.